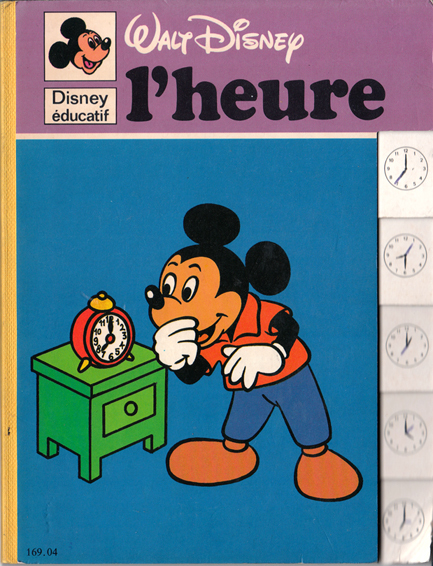 Description: Super-rare board book from the Disney éducatif series in which everyone's favourite mouse teaches youngsters about the time. Pictorial boards with yellow cloth spine. The book was used as a rest at some point in its life, as a few letters and shapes are discernible on the boards when viewed under direct light. A particularly astute pupil noticed that the clocks were missing a second hand, and has duly added it to each of the clocks printed on the tabs (refer to image). Corner of rear board curling. School stamp on first page. Otherwise all other pages in excellent, unmarked condition. Measures 19.5 cm × 15 cm (7.8″ × 6″). Small 8vo. Unpaginated.